Mobile ads are unique from the more traditional desktop ads in that they offer a more direct marketing pitch to the user. Furthermore, the ads are displayed at the convenience of the user, right at their fingertips. The process of converting website visitors into paying customers in much simpler in mobile form. As marketers, we have greater access to your target audience, which places the onus on us to effectively reach them. Call 800.231.4871 for mobile advertising services. With the attention spans of mobile users so short, there exists about a 2 second window to capture their attention. Consequently, click-to-call functionality is a major asset to the mobile ad designer. Securing a verbal connection with the prospective customer is the hardest part of the process. Once that point is reached, the likelihood of converting them into a customer dramatically increases. DFW SEO is eager to help you get started with reaching more mobile customers today. Like with desktop, mobile search results display PPC ads on the very top, above the traditional organic results. The difference in mobile SERPs, is that the screen and subsequent viewport, is much smaller. To see organic results, users must scroll down on their mobile device, a task they’re not too fond of with their short attention spans. That doesn’t mean companies should ignore mobile SEO entirely, on the contrary. Instead, they should use both methods to create the ultimate marketing solution. 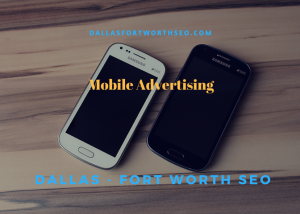 The team at Dallas – Fort Worth SEO creates mobile advertising campaigns to help local business thrive in their market online. We make our goals and objectives clear from the get-go; generate quality leads and encourage conversions. In our years working with small businesses throughout the Metroplex we’ve come to learn that those goals align with most companies. Furthermore, we consistently monitor ad performance and make real-time adjustments on-the-fly when necessary. Call 800.231.4871 for mobile advertising services. Updated on April 5, 2018 at 8:46 pm by Dallas / Fort Worth SEO.